We love a good soup recipe around here. They are fairly simple to make. Usually nothing burns if I forget about it or have to walk away. There is almost always leftovers. Its my perfect dinner combination. 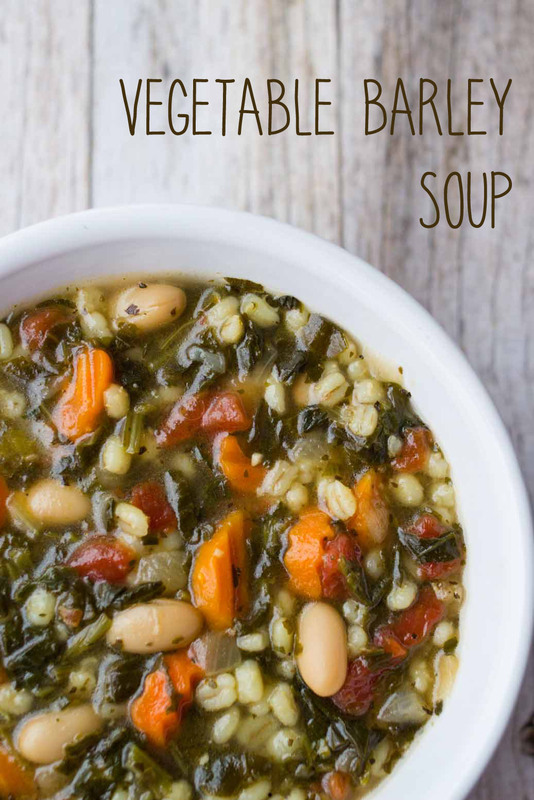 This Vegetable Barley Soup came to fruition when a little bag of barley was placed in my cart at Aldi's. (Shopping with kids is so fun.) Anyway, it was a good buy that turned into a delicious soup. 1. Add the oil, onion and garlic to a large sauce pan. Cook for 2-3 minutes. 2. Add the carrots and barley. Stir well to coat the barley in oil. 3. Stir in the tomatoes, chicken broth, red pepper and basil. Bring to a boil. 4. Cover and reduce heat to a simmer. Let simmer for 20 minutes. 5. 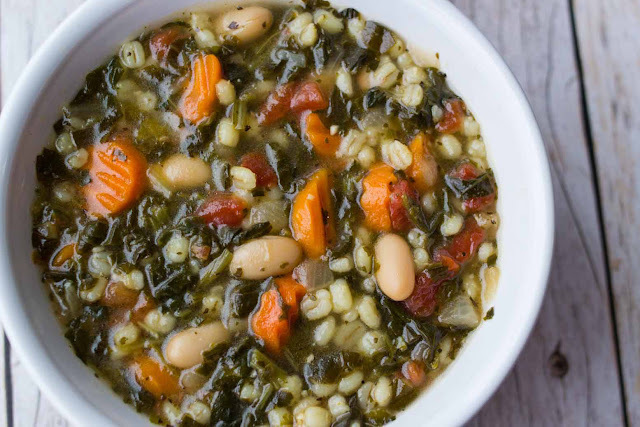 Add the spinach and beans. If needed add additional water. Bring to a boil. 6. Reduce heat and let simmer for 30 minutes. 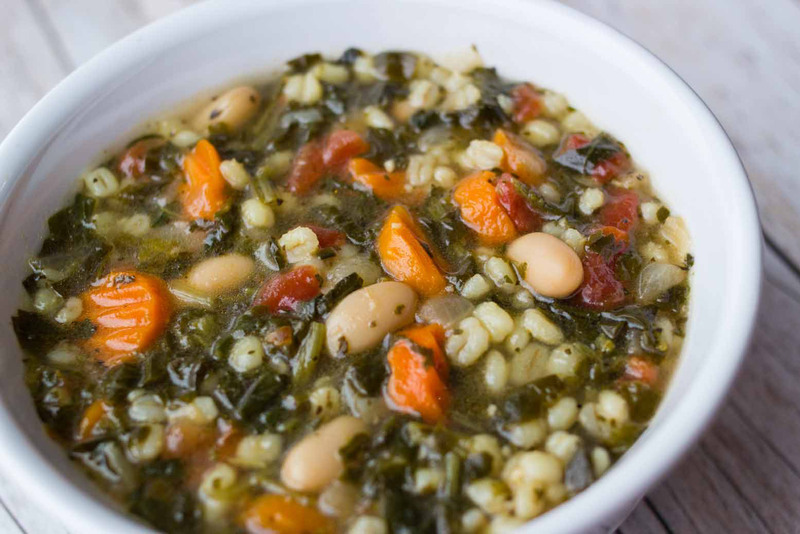 Adapted from Earthly Grains Quick Cook Barley Recipe. Random confession time: I am not a fan of beans or onions. I will either modify my recipes to not include these or just pick around them when eating. But I do love chili which usually contains both. Well I love dipping with chili... rolls, crackers, bread doesn't matter. But its hard when you have a bowl full of beans. 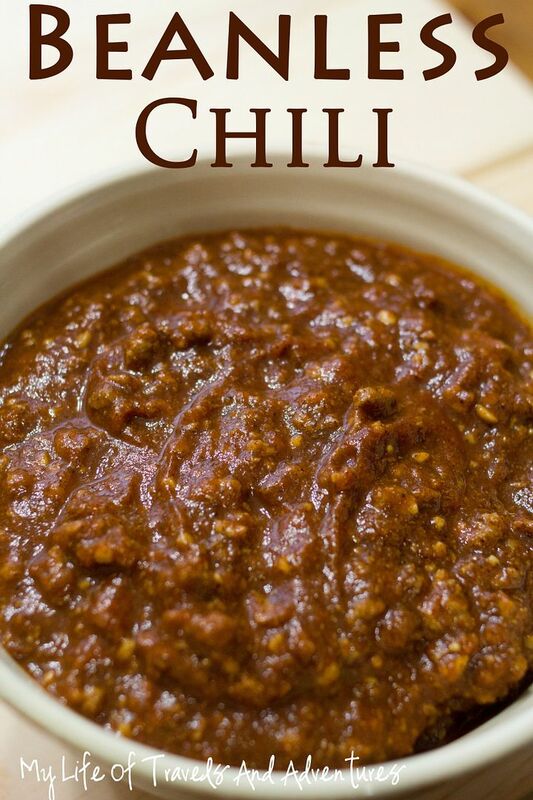 So this recipe is my perfect chili for dipping. I usually make a batch for me and a batch for Neil that contains beans and onions too. 1. Brown the beef in a pan. Once browned add the garlic and cook for 2-3 minutes. Drain. 2. Add all the ingredients to a pot and bring to a boil. 3. 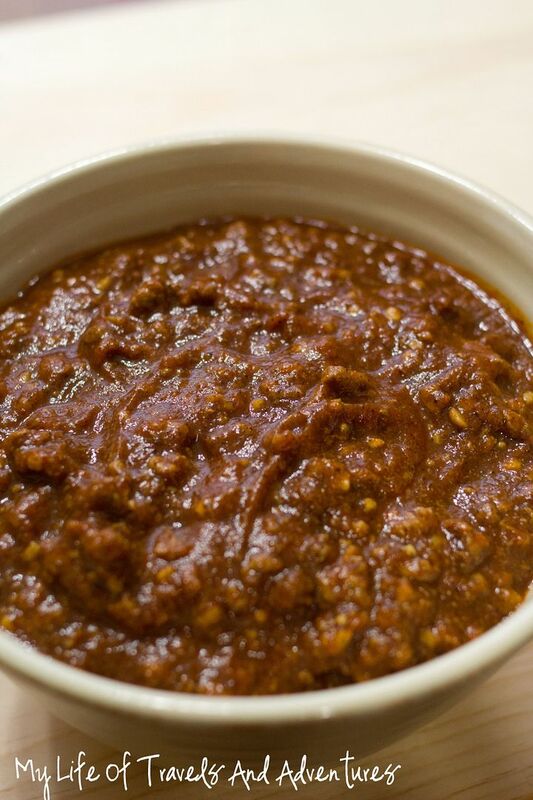 Reduce the heat + simmer for 1 hour. This week went flying by and pretty much dragged on and on depending on the time of day. I have been off on my days since Tuesday and its just throwing me for a loop. So, I think its Friday. Right? And I thought I would share some favorites from around the internet today. 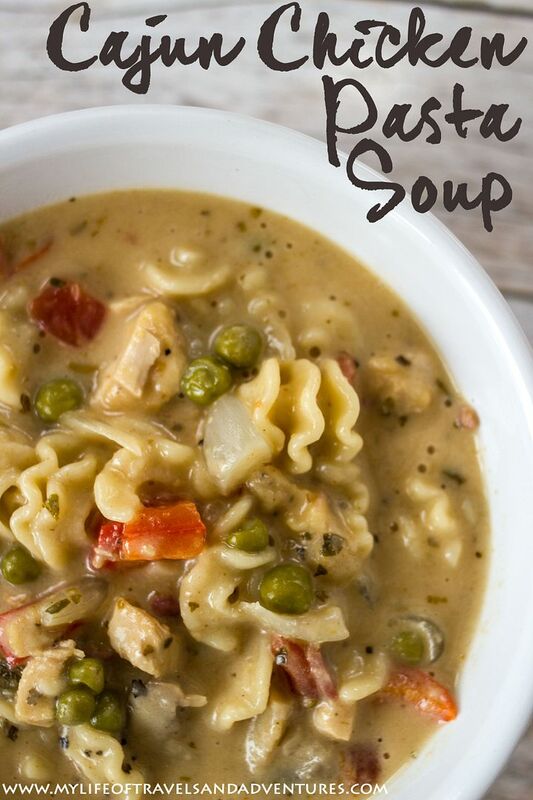 Its been wet and dreary this week... which is perfect soup weather. 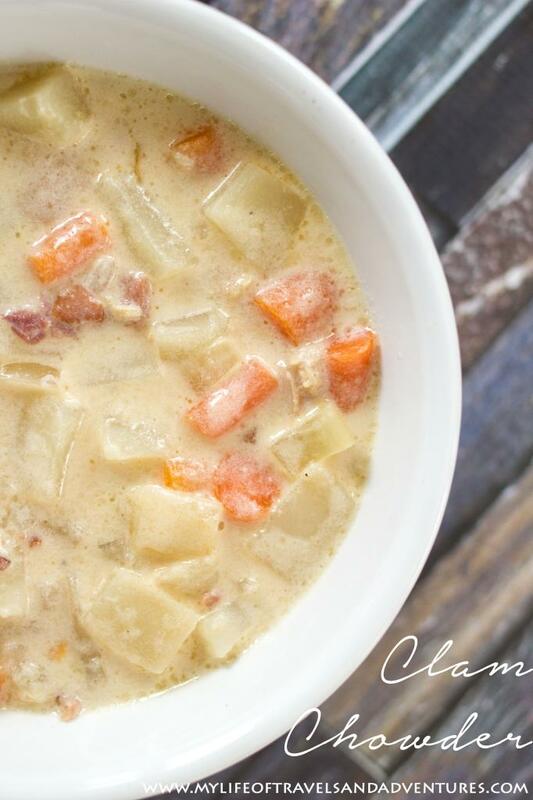 I made this New England Clam Chowder recipe earlier in the week and have been loving the leftovers for lunch. The newness of all the holiday/birthday toys is slowly wearing off but both kids have a favorite (right now) toy. 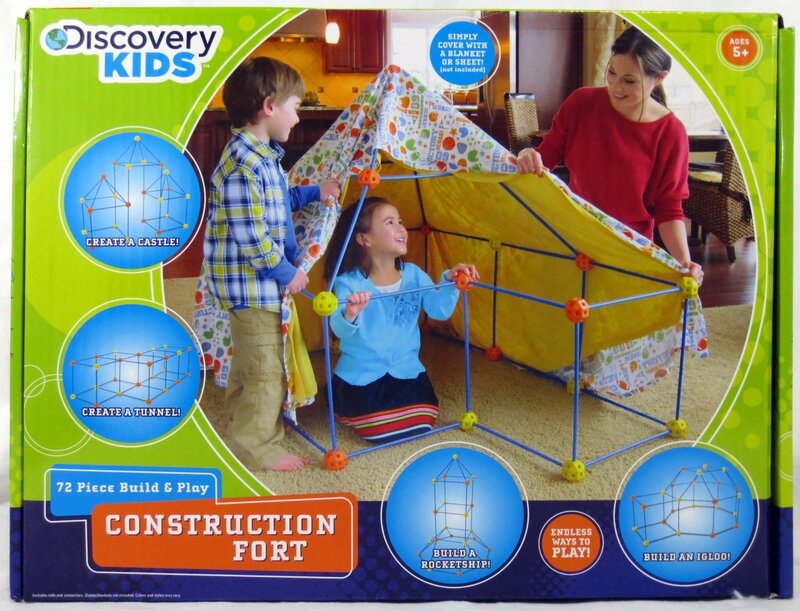 Reid got these Discovery Kids Fort building set for Christmas (and another set for his birthday) and we both love them. They make fort building super easy and have been played with constantly. 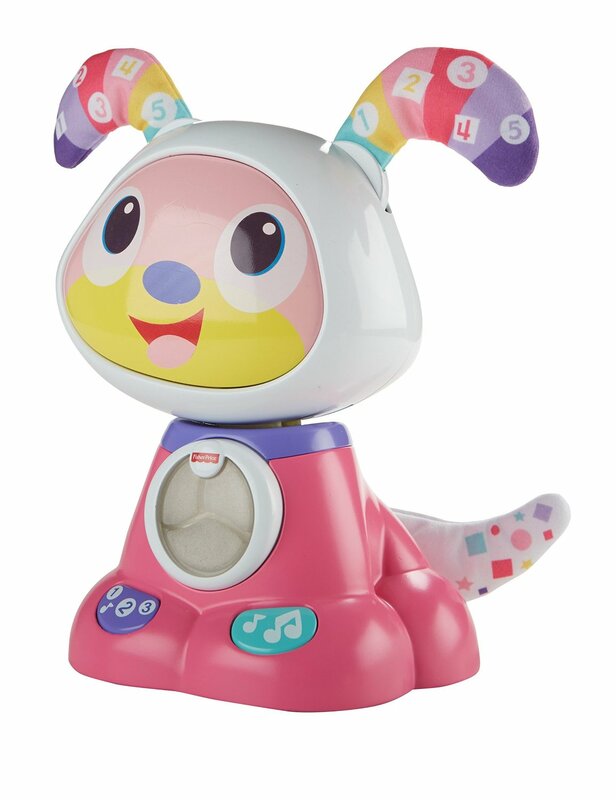 Bryn got this FisherPrice Dog for her Birthday and she is constantly making it play music and dance. The songs are actually cute (and really catchy). This dog gets dragged by its ears everywhere around the house. I have been on a garden planning roll lately. We are going to do away with the raised beds this year and just till a big 30' x 30' plot. Which means a much larger garden for me to play in. But that also means it is going to take a little more planning to figure out what the plant where and how many plants we need, how much seed to buy and such. I have always enjoyed the Farmers Almanac website for garden info but this year I have been playing around with their garden planner and think I finally have this years garden planned out. Maybe. I'll be back with some garden posts in the next couple months. This post is an oldie... Simple Toddler Meals... way back when I was packing lunches for daycare. (Hard to believe that next year I will be packing his lunch for Kindergarten). 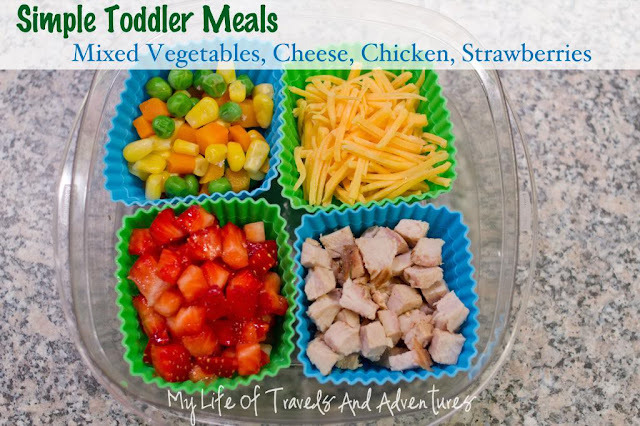 I used these reusable baking cups with these Rubbermaid containers. My Life of Travels and Adventures is a participant in the Amazon Services LLC Associates Program, an affiliate advertising program designed to provide a means for sites to earn advertising fees by advertising and linking to amazon.com. It has been a while since I blogged. Well years actually. I have all sorts of excuses like... Running a business or having a baby... But the reality is, life got hectic and the few hours a night I used to spend blogging were spent catching up on sleep or housework or something. Although its been a few years, I have been working on a few blog posts here and there as time would have it. So I have a dozen or so stocked up and ready to share as well as a few half started and a couple more in the works. Now that the baby (are they still babies at 14 months) is taking a pretty decent afternoon nap fairly regularly, I find myself with a little spare time on my hands and am itching to get back to sharing regularly around here. 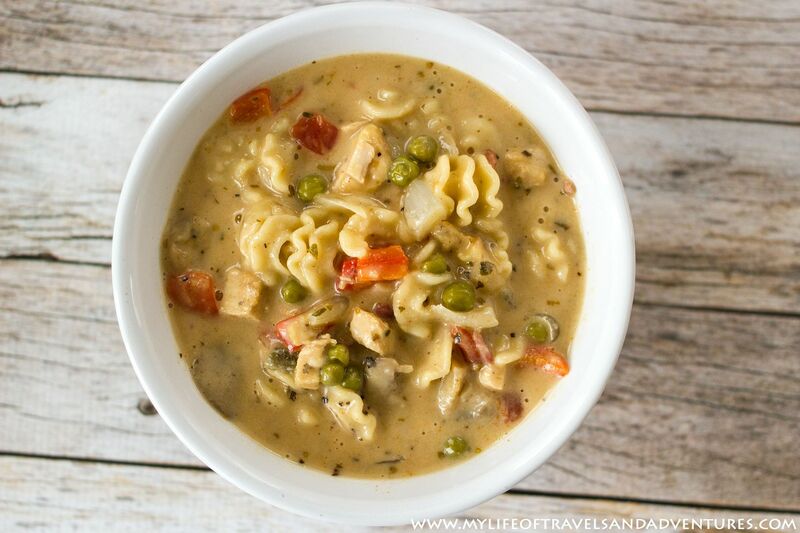 First up is this delicious Cajun Chicken Soup recipe. 1. Heat the olive oil in a skillet. Add the cubed chicken and cook thoroughly. 2. Remove the chicken and place in a large stockpot. 3. In the skillet, heat the onions and garlic stirring regularly for 2-3 minutes. Add the pepper and mushrooms and cook for another 2-3 minutes. 4. Add the onion/pepper mixture to the stockpot, along with the peas, chicken broth, pepper, oregano and cajun seasoning. Bring to a boil. 5. Meanwhile in the skillet, combine the flour and heavy cream. Mix thoroughly to remove clumps and bring to a simmer. 5. 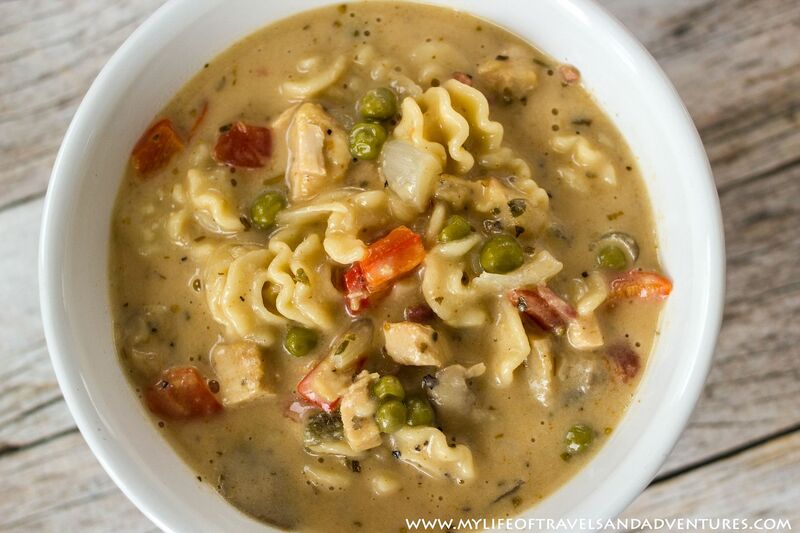 Add the pasta and heavy cream mixture to the stockpot and cook for 10-12 minutes. 6. Crumble the bacon and top each bowl with some bacon. Enjoy!